For years one of my cinematic dream projects has been for someone to bring the story of the life and times of country music legend Hank Williams to the big screen in a way that’s befitting of the late singer. I always felt it was a story ripe for a retelling after, incredibly, having only been brought to the screen once in the safe and sanitized 1964 film, Your Cheating Heart, a film that starred George Hamilton in the lead role and featured songs performed by Hank Williams, Jr. When I heard about writer/director Marc Lawrence’s plans to do just that several years ago I could barely contain myself with excitement and enthusiasm at the thought of finally getting to see a warts and all biopic of Williams. Now, after having seen the film, all I can say is I can’t wait for the next attempt at a take on Williams’ hard life and times, which, sadly, probably won’t ever happen. Most biopics usually strive to do one of two things well and sometimes succeed at both. The filmmakers usually take aim at either the creative process of the artist or the more salacious elements involved in the subject’s life. I Saw the Light doesn’t even make an attempt to accomplish either of these things. When you go to see a film about a subject such as Hank Williams, an artist who literally died as a result of alcoholism, you expect to see scenes of high drama depicting the nasty side of said disease. Those scenes are not to be found in this film and neither are the scenes depicting the artist’s creative process which leaves one to wonder just exactly why the film was even made in the first place. You know you’re in trouble when the film ends and the filmmakers don’t even go to the trouble of depicting the singer’s death and instead have a secondary character announce it from the concert stage instead. British actor Tom Hiddleston, better known from his appearances in the Marvel Comics’ Thor films, inhabits the role of the film’s subject quite well from a physical standpoint. He also appears to sing his own songs in the film and I will most certainly give the actor props for attempting to do that. The trouble is that even though Hiddleston embodies the physical essence of Williams, he never quite seems to get the voice completely down, every now and again letting his Alabama accent come and go at will. It’s more than a bit distracting. 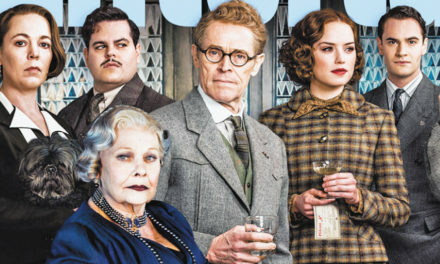 Elizabeth Olsen is decent but saddled with an underwritten part in her role as Williams’ long- suffering wife, Audrey. It’s a shame that the film looks as good as this one does but has no real heart or narrative drive to keep the audience engaged. All we’re really left with is Hiddleston’s performance and the inclusion of Williams’ songs on the soundtrack and that’s not nearly to recommend the film, even to die-hard fans of Hank Williams.